The Ten Commandments Are A Reflection Of God’s Character And An Expression Of Who He Is. We can know God by the ten commandments. If the law is a reflection of God’s character and humans are made in God’s image, then the law fits human nature as well as that of God. It follows that humans are structured to follow certain laws and operate in certain ways. For instance, a car that is not made for diesel fuel will not be able to run well on diesel. The car might stop altogether with water or sugar in the gas tank. Likewise, if one runs full speed into a brick wall, chances are that one will do more damage to himself than to the wall because the wall is stronger. If a person jumps from a plane, he may feel as free as a bird for a moment, but unless he has a parachute, the law of gravity will bring him crashing to the ground. The second Purpose of the law is the pedagogical use of the law, in which the law is a Custodian. 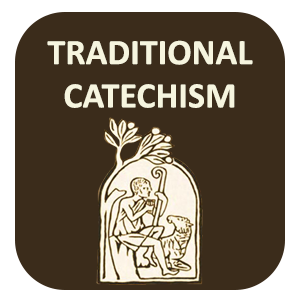 Jerome: A Custodian is given to infants to rein in an age full of passion and to restrain hearts prone to vice until the tender infancy is refined by growth...yet the custodian is not the Father,....The custodian guards another person's son and will depart from him when the lawful time of inheritance arrives. Theodoret: Now it was necessary that the law be given, as it fulfilled our need of a custodian. And it freed us from our previous impiety, taught us knowledge of God and then brought us to Christ the Lord as though to some wise teacher, so that we might be instructed by him in perfect learning and acquire the righteousness that is through faith. Chrysostom: Now if the Law was a custodian and we were confined under its direction, it was not opposed to grace but cooperated with it. But if it continues to bind us after after grace has come, then it is opposed to grace....Those who maintain their custody at this point are the ones who bring the child into the greatest disrepute. The custodian makes the child ridiculous when he keeps him close at hand even after the time has come for his departure. Since the Fall of Adam and Eve every person is born into this condition of sin "For I know my iniquity, and my sin is always before me" (Psalm 51:5) "For as by the disobedience of one man, many were made sinners; so also by the obedience of one, many shall be made just." (Romans 5:19). God gave us His law to reveal not only His holiness, but our sinfulness. “Now the law entered in, that sin might abound. And where sin abounded, grace did more abound." (Romans 5:20) In other words, God’s law was given so that all people could see how sinful they were. Through the law we are reminded and convicted of how far we have fallen from an relationship with God and the impassable chasm that exists between us. A person can be told he has dirt on his face. The person will go to a mirror to take a look. The mirror accurately reflects a true image. The dirt is indeed there. The person might walk away from the mirror, but his “dirty face” condition remains. Washing the mirror or taking it away does not clean the face. God’s law is like a mirror. When gazed into it shows man’s true condition. Ignoring or rejecting the law does not take away our condition of sin. When facing the standard of God’s holy law we realize there is not one of us who has not sinned. All have sinned and fallen short of God’s standard. Let’s say that a chain represented our lifeline to God. It was the means by which we could reach Him. The way by which we could restore the position once lost. And each link in the chain represented a law of God. We would need to keep each law perfectly in order to be reconciled with God. In fact we would have to be born in this perfect condition. Only two people were born in this perfect condition. And that was Jesus who was the Son of God, and the Virgin Mary, born full of the grace of God from conception. 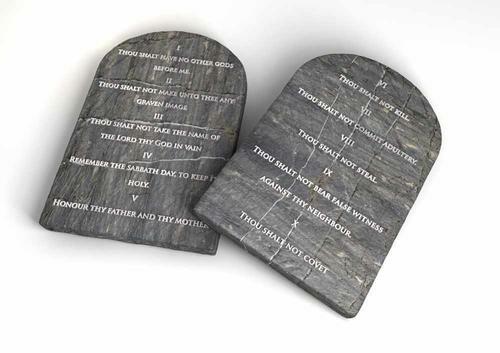 Let's say a person were only to break one of the ten commandment once in his life? That would be a pretty righteous person. But are they good enough for God’s requirements? If a person were hanging by a chain and one link broke, they would fall. It doesn’t take breaking every link to fall from God – just one! Who is God? He is a Holy God. Who is man? He is A Sinner. Sin has alienated mankind from God. It has made the whole human race at enmity with Him. We selfishly seek after those things that fulfill our depraved passions. We lift ourselves to be our own gods, running our own lives, controlling our own destinies. Humankind is bent toward evil as a tree bends to the light. Human nature is to operate in contradiction to the law of God! Why? Because we are born sinners. As if this were not bad enough…there’s more! Not only have we been separated from God because of sin, but this separation brings with it consequences. When we go to work at a job we receive wages (pay) for the work we did. It is inevitable – that is why we are employed. In life, wherever there is a work of sin, there is an accompanying wage (payment) for the sin worked or committed. It is called the wage of death. When man works sin he receives death. When Adam sinned, sin entered the entire human race. Adam’s sin brought death, so death spread to everyone, for everyone sinned. Yes, people sinned even before the law was given. And though there was no law to break, since it had not yet been given, they all died anyway—even though they did not disobey an explicit commandment of God, as Adam did. God is life. When separated from him there is inevitable death. Like a grape on a vine. When the grape is cut from its source of life, it dies. When Adam sinned there was immediate death and alienation from the life that is within God. Sin also brought physical death. A dead person does not respond to sights, sounds, or touch. In the same way, the spiritually dead are unable to see, hear, or touch Him. The fact of our death in sin explains our helplessness. Without life there is hopelessness and despair. We were created eternal beings (this is part of being in the likeness of God). He created us to enjoy fellowship with Him forever. When sin entered, our physical bodies would perish, but our spirit would live forever. For those who have sinned (all of mankind) separation from God is for eternity. This means suffering eternal death in a place God created for Satan and his angels called Hell. It is a place of torment and fire. Though there will be “weeping and gnashing of teeth” the worst part is being banished from God for all eternity with no hope of ever getting out. Does this make God unreasonable? Does it make Him merciless and unrelenting? Not at all! God in His holiness can not abide sin in man. It’s like trying to mix light and darkness, or good and evil. Left to himself, mankind’s condition of sin leaves him helpless, destitute, alone, hopeless, and separated from God. But remember, after Adam and Eve sinned, God promised he would provide an answer to this devastating separation of man from Himself. And that answer was Jesus Christ and what did he did on the cross for us. So what is our part? As we said, one of the reasons the Ten commandments were given to us, is to show how sinful we really are. II. Believe on Jesus as the one who bore your sin, died in your place, was buried, and whom God resurrected. your mind and your actions toward that thing. IV. You must desire and seek to be baptized. V. If you will do these four things and truly mean it then this is what God will do. In the next 10 lessons, we will discuss each of the ten commandments and what they mean. But beware, the more you learn the commandments of God, the more you are held accountable for in eternity. So please prepare for your eternity by fully committing your life to Christ so that he can give you a new heart and so that he can "put His spirit in you"and give you the power of that spirit at your confirmation so that you may be able "to walk in His commandments, and keep His judgments, and do them".